I hope you are ready for a long and restful weekend. Certainly, I'm as this has been a tough week with lots of new challenges and lots of new learning, which is great. On this post I would like to point out a very interesting post about using delegates in Microsoft Dynamics AX 2012. The post was written by Marcos Calderon, who works for Microsoft as their SDE Lead. 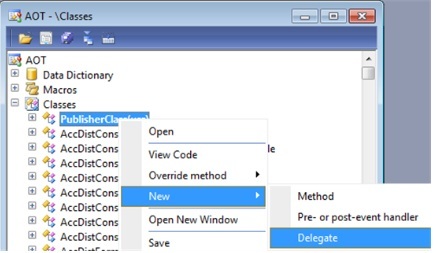 In his post he starts by showing us how to create a delegate in Microsoft Dynamics AX 2012, then he explains what delegates are and why they are used. He also explains what Event Handlers are and their relationship to the AX 2012 AOT. Finally, he give us an example on how to add an event handler programmatically in X++, and how to publish the subscriber into the same tier for later use. "...X++ delegates expose the publisher -subscriber pattern where a delegate defines a clear contract in a publisher class. This contract is used when an event occurs where the event can be a change of state, where all interested classes receive notification that the event has occurred." You can access his post from here. Well folks, that's all for now and until the next post!